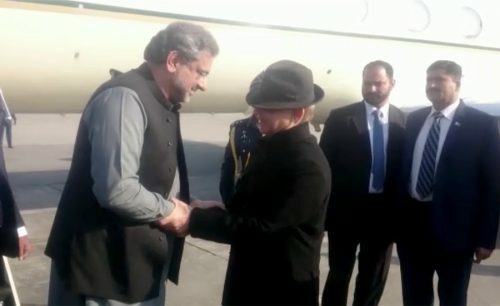 LAHORE (92 News) – Prime Minister Shahid Khaqan Abbasi has on Monday met former prime minister Nawaz Sharif at his residence in Jati Umra. Punjab Chief Minister Shehbaz Sharif, Federal Minister for Railways Khawaja Saad Rafique and Punjab Chief Minister were also present in the meeting. The meeting discussed matter relating to current political situation, Senate elections, internal party affairs. Matters pertaining to opposition protest also came under discussion in the meeting. Earlier, Punajb Chief Minister Shehbaz Sharif and other officials welcomed the prime minister upon his arrival at the Lahore airport.